Play American 8-Ball Pool, one of the best free online 8-ball pool games with excellent AI computer players. 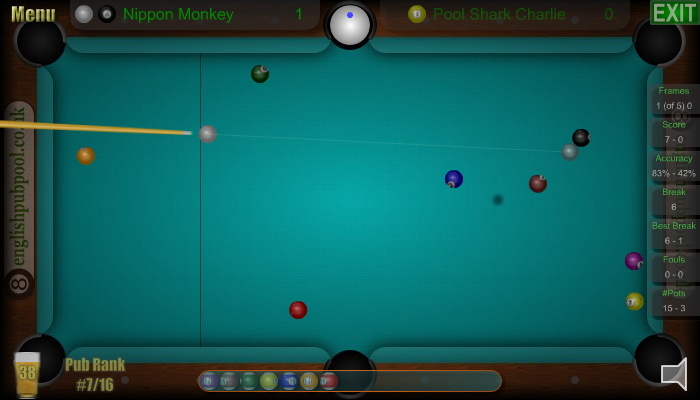 Play 8-Ball Pool and Straight Pool Tournaments against fast thinking computer players, and set top scores in the Challenges and Time Attacks. There are over 50 trophies to be won for big breaks, special shots and top scores. Enjoy! Play more pub games on englishpubpool.co.uk, play UK 8-Ball Pool, 9-Ball Pool, 501 Darts, Multiplayer Darts and Snooker games. Play American 8-Ball Pool! One of the best and most complete flash pool games on the web! With lots of 8-ball pool Tournaments and various pool Challenges with leaderboards. Can you win the 6 pool tournaments to become the pub champion and rank #1? Play 8-Ball Pool Tournaments against the computer. Win the eight ball tournaments to unlock more cups and to improve your Pub Ranking. Play Two 8-Ball Time Attacks. Play pool against your friends (Human Vs Human Pool games: 8-Ball Pool and Straight Pool matches). Top score Leaderboards for all of the challenges and 8-ball pool cups. Compete against your friends to see who rules the table. Excellent billiards physics with realistic cue ball spin control. Game stats are automatically saved.